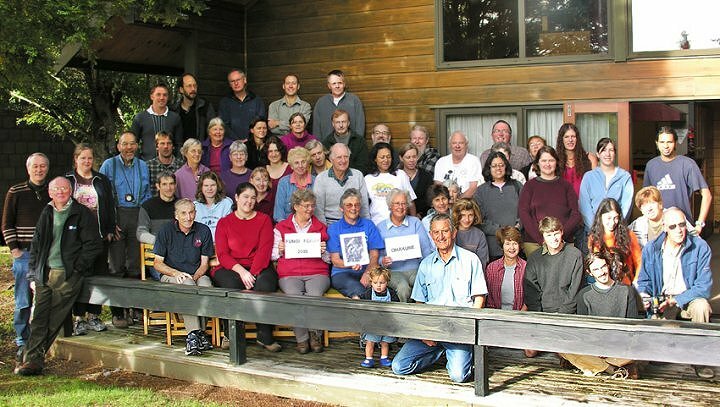 The 19th annual NZ Fungal Foray was held this year from 4-8 April at Ohakune. There were between 33 and 44 professional and amateur mycologists staying at any one time. 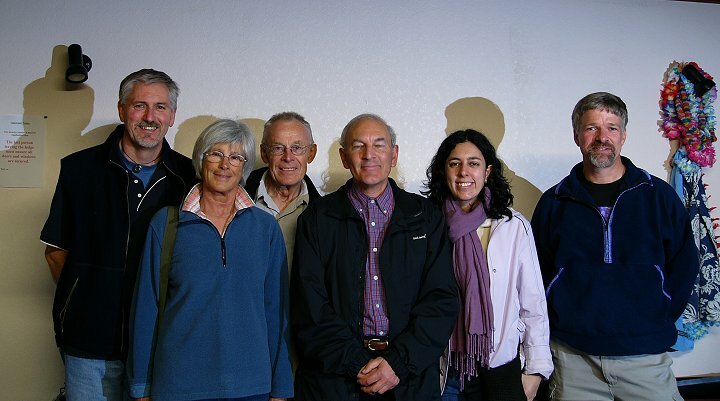 We had visitors from Switzerland, Australia, Thailand, England, Spain and USA. Accommodation was at the Ruapehu Ski Lodge and the Wairarapa Ski Lodge, Turoa Alpine Village, just outside of Ohakune. 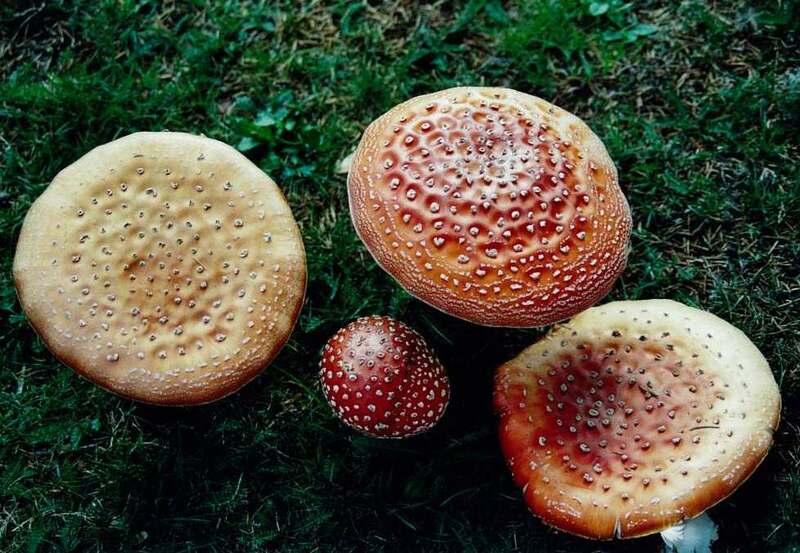 We arrived to find a group of fly agaric (Amanita muscaria) of various ages greeting us between the two lodges, as though planted there for our benefit. As we walked around amongst the lodges we were to see stunning displays of this exotic species. Also present amongst the grassy surrounds were Suillus luteus and species of Russula and Scleroderma. Each day's foraying involved collecting in the field and then identifying our finds back at the Turoa Alpine Village, labeling them and displaying them on tables set aside for the purpose. Many of the collections were then dried to take back to the Landcare Research herbarium in Auckland. I took on the task of keeping a list of all the species collected and where found but then was joined by Shaun Pennycook and together we worked on recording the information directly onto computer. For the first day of foraying we headed north to Erua Scarp, an area dominated by matai (Prumnopitys taxifolia), mountain celery pine (Phyllocladus alpinus), pink pine (Halocarpus biformis), silver pine (Lagarostrobos colensoi) and some mountain cedar (Libocedrus bidwillii). Along the way we saw massed displays of toetoe (Cortaderia fulvida), with their drooping panicles, lining the sides of roads, tracks and railway lines. Fungal highlights for the day were finding several fruiting bodies of sky blue mushrooms (Entoloma hochstetteri) and a lovely group of pale blue pouch fungi (Weraroa virescens). 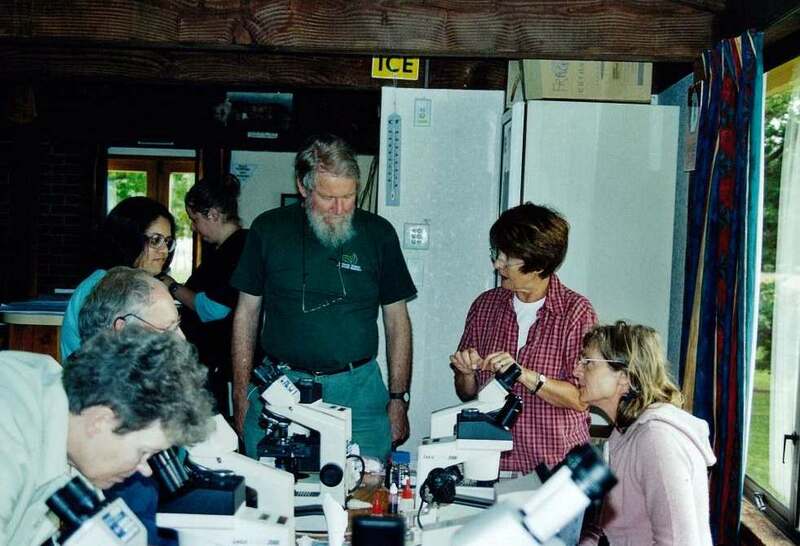 This day many of us spent attending a workshop on waxgill fungi presented by Clive Shirley. Waxgills are small, brightly coloured mushrooms found on the forest floor. There are six genera of waxgills, Gliophorus (glutinous), Humidicutis (identified by splitting of the gills and often with a translucent stipe), Hygrocybe, Hygrophorus, Bertrandia (which go black with age), and Camarophyllus. Waxgills get their name from their waxy appearance. The spore print is white. During the day we went to Ohakune Lakes Reserve hunting for waxgills to collect for identification. Just inside the entrance to the reserve we found a group of poplar mushroom (Agrocybe parasitica) on a living tawa (Beilschmiedia tawa). An unidentified species of Entoloma was quite common on the forest floor and the introduced orange pore fungus (Favolaschia calocera) was common on dead wood. Back at Turoa Alpine Village we were excited to find a wonderful display of stinkhorn fungi (Mutinus ?ravenelii) growing in a clump of Cortaderia fulvida. This starts out as a whitish egg, which opens to reveal a phallic looking stalk varying from light crimson to a dark crimson at the tip. The foetid, gooey spore mass has a sugary component and flies attracted by the odour happily lap up this material as a gourmet delight and thus aid in the spore dispersal. Inside the conference building, proudly occupying the centre of the display table was a wonderful example of the native bracket fungus Laetiporus portentosus, at least half a metre across. It had been found growing on a living Nothofagus tree amongst beech forest in Rotokura Ecological Reserve. To the east and slightly south of Turoa Alpine Village is the Rangataua Forest and Ecological Area. Rangataua Forest is largely comprised of red, silver beech (Nothofagus menziesii) and mountain beech (N. solandri var. cliffortioides). This is where we spent the day, meandering over the flat terrain amongst swards of crown fern (Blechnum discolor) and Polystichum species. The forest is situated on the largest lava flow in New Zealand, the Rangataua lava flow. Japanese umbrella mushroom (Coprinus plicatilis) was common in places on the forest floor. Another ink cap species, sociable ink cap (C. disseminatus), was seen in several colonies on dead logs. Also common on decaying wood were colonies of Hypholoma brunneum and Mycena interrupta. Underneath an old log we found a beautiful coral fungus (Ramaria samuelsii), but the biggest highlight for the day was the discovery of a huge bracket fungus (Bondarzewia berkeleyi) measuring 1.5 metres across. After dinner that evening there was a discussion on the setting up of an incorporated society, the Fungal Network of New Zealand (FUNNZ). This had first been discussed at the 18th Fungal Foray held in Nelson last year. A subcommittee had been set up at that time and Ross Muir undertook the task of formulating a constitution for the new society. The new constitution was discussed and passed. We then voted in a committee. The office bearers are David Orlovich, President; Peter Buchanan, Vice President; Jerry Cooper, Secretary; Paula Wilkie, Treasurer; Geoff Ridley, corporate member. The day started with Peter Johnston presenting the results of some impressive research in Murphy's Bush undertaken by Clive Shirley. Murphy's Bush consists of kahikatea (Dacrycarpus dacrydioides) forest with a sparse understorey dominated by nikau (Rhopalostylis sapida). There is not much wood lying on the forest floor, so there are very few wood-rotting fungi. Clive has recorded 33 species of waxgill fungi in this reserve. The data collected indicate that the cooler and wetter it gets the higher the number of fungi found. He has found waxgills fruiting in specific places in the reserve, but Entoloma species are found scattered in random locations. Next came Genevieve Gates, University of Tasmania, who told us about research she has done comparing macrofungi in a logged and an unlogged area of Eucalyptus forest. The study areas are part of a 19,900 hectare area of forest in Tasmania. Between June 2003 and June 2004, the number of species recorded was 307. Of these 176 were only found in the mature forest, 59 were only found in the logged forest and 72 were common to both. The species common to both were predominantly saprophytic species that grow on wood. 26-28 months after logging ectomycorrhyzal species were noticeably fewer in numbers in the logged area. The species found in the logged site were mainly those characteristic of disturbed sites. After morning tea Bettye Rees, University of New South Wales, talked about Myriostoma coliforme in NSW. M. coliforme has the common name of "pepper pot" because of the holes on the fruit cap. It is monotypic, i.e. the only species in this genus. It is included in the order Lycoperdales and is a member of the Geastraceae or "Earth Star" family (e.g. Geastrum spp.). It is found in the Sydney region, also in Sweden, Channel Islands, USSR, Hungary, North America, India, South Africa and Brazil. It is found in well drained, well mulched soils facing the sun on slopes. Bettye questioned whether it is indigenous to Australia or an exotic, and wants to know if the species is present in New Zealand due to its presence in other Southern Hemisphere countries. 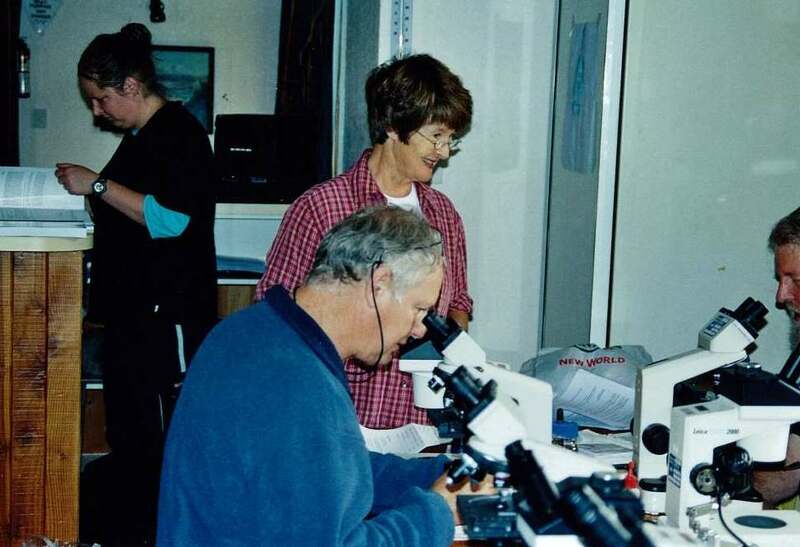 Pam Catcheside, State Herbarium of South Australia, then showed pictures of South Australian fungi. At present there are no South Australian fungi on the rare and threatened list, and she wants to correct this omission. Following her came Juan Eiroa, speaking in Spanish and interpreted by his daughter Elisa. They showed slides of edible and poisonous fungi found in Spain. 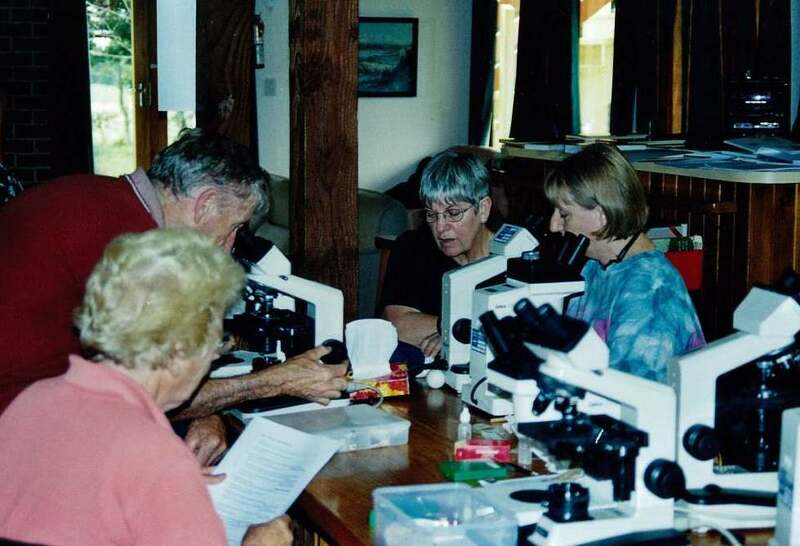 Don Horne finished the morning with slides taken in Walter Scott Reserve, a reserve owned by Forest and Bird situated on the southern foothills of Mount Pirongia, south-west of Hamilton. After lunch Geoff Ridley gave a talk on the HSNO Act, which controls introduction of new organisms, and the work of ERMA. A "new organism" is one defined as not present as at the 29 July 1998, but no provision was made to determine what was present as at that date. Next, Patricia Crane, Ensis, spoke on Chrysomyxa rusts on rhododendrons and spruce. Rust fungi are obligate parasites, i.e. confined to living plants of particular species or genera. Ian Dickie, Landcare Research, then spoke about his work on mycorrhizal fungi below ground. Somewhere between 80 and 90 percent of plants form mychorrhiza. Of these three percent of plants form ectomycorrhiza but the plants occupy a huge percentage of land area. Ian spoke of the two main types of mycorrhizal fungi, arbuscular, which occur within the root itself and reproduce in the soil nearby; and ectomycorrhizal the fungal hyphae of which cover the surface of the root tips and often produce large, above-ground fruit bodies. There are approximately 76,000 species of fungi. Next came Katrina Walbert, Ensis, presenting her PhD project. Her work is on the succession of ectomycorrhiza on Pinus radiata. She is investigating the species diversity on these plantation trees at different stages of the plantation with molecular methods. There is a nitrogen and phosphorus deficiency without mycorrhizal fungi and the diversity of fungi declines as the forest matures. Afternoon tea, and then Suzy Draffin, Otago University, described her research on fungal diversity in the canopy of silver beech. Soil collects in the forks of trees and adventive roots invade this soil, making an ideal climate for the fungi. Following her, Andrea Roberts spoke on the role of arbuscular mycorrhizal fungi in facilitating the invasion of tussock hawkweed (Hieracium lepidulum) in New Zealand. Toni Atkinson, Otago University, then gave a talk on two new Chaetosphaeria species found on the west coast of the South Island, C. albida [ined.] which has a whitish fruit body, and C. luceargentia [ined.] which has a fruit body that shines like silver. Peter Austwick, research associate of Landcare Research, followed with an interesting look at examples of fungi found in works of art. He has traveled round the world visiting art galleries and private homes. The final speaker for the day was Sucheta Joshee, Landcare Research, who spoke about fungal endophytes of some New Zealand podocarps. After dinner that evening we had a discussion of next year's foray. It was decided to investigate having it in Kaikoura or Karamea in the South Island. Then we had slideshows by Don Horne, Ross Muir and Clive Shirley. For our final day of foraying a group of us went to the Blythe Track with a group of school children from Kimbolton School. The area had been forayed before, but we still found enough to interest the children. Photographs supplied by Clive Shirley, Ross Muir and Michael Pilkington. I wish to thank Shaun Pennycook and Peter Buchanan from Landcare Research for editorial assistance and re-identification of some species. In total there were 438 collections deposited, representing 298 taxa. 3 collections were of species currently flagged as Nationally Critical in DOC's classification (Ramaria junquilleovertex, Squamanita squarrulosa, Russula littoralis), and 67 collections (of 44 taxa) were of records flagged in the DOC classification as Data Defficient (and therefore represent particularly import additions to our knowledge). The following is a list of the collections compiled from the PDD database on 16th January 2005. More details on collections may be found on the NZFUNGI website. A full species list is available in the species report in Adobe Acrobat PDF format.